This is one of the initial expressions from Wolfburn Distillery. It is 3 years old and 16.000 bottles were made. Malted barley and new make spirit is first things that hit my nose. Then some apples, vanilla and sweet fruity notes. 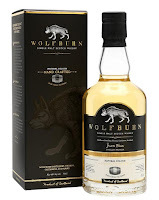 Still young in the taste, but it starts moving away from the classic young-whisky notes. Still some malt, but now mixed with grass and hay. The oak is actually present as well and some spices mixes in. Peppery notes. The finish is long and sweet, but still with the grass and hay and maybe some smokiness (from the burned oak). The youthfulness shows in the smell, but already here after three years, it is quite flavourful in the taste and finish. Is this a great whisky? No. Do I look forward to other Wolfburn expressions and do I think they have potential? YES! I will give this 80/100 (19/20/21/20).